Though pataki chakra is one of the hallmark of jyotisha shastra in judging ill health and arishtas, it is not given the due attention by many practitioners. However, the astrologers from the eastern parts of India relied on this quite heavily for Judging Balarishta. Draw three verticals and three horizontal lines. 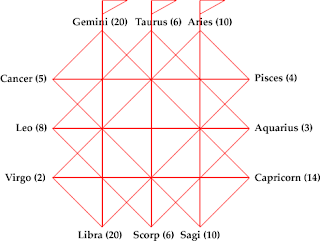 There would be 12 ends of lines each of them shall be assigned to 12 signs from Aries to Pisces. Movable signs shall have vedha from and cause vedha to the dual signs excluding the one in the 3rd from it; Fixed signs shall have vedha among other fixed signs; whereas the Dual signs shall have vedha from and cause vedha to all movable signs excluding the one in the 11th from it. Draw all the vedha causing lines and the resulting diagram is known as the Pataki Chakra. I have compiled this list of planetary characteristics from various classics. This shall help you in gaining better understanding of the planets and use them in predictions.